During my last trip to Kauai, we took an “off-ramp” we hadn’t taken before, but had always wanted to explore — the small road to Hanapepe Town. I was originally intrigued by the town when I saw it’s slogan, “Hawaii’s Biggest Little Town.” What could that possibly mean!? Well, one stroll through the town, and it’s clear the slogan is spot-on. Hanapepe on Kauai is a collection of unique, small, boutique-style shops and restaurants that, together, comprise a sweet, unique, not-too-serious atmosphere. A little history: According to Hanapepe.org, Hanapepe means “crushed bay,” perhaps so named due to the landslides in the valley or the appearance of the cliffs from the sea to the rocks surrounding the deep bay area. Commerce is still an important part of Hanapepe. Restaurants and shopping abound in this small town. In earlier times, besides growing taro, kalo, from which “poi” is made, Hawaiians developed salt, cultivated in saltwater ponds for trade with sailors. The native people of Hawaii inhabited the fertile valley of Hanapepe for centuries before Captain Cook arrived in 1778. Hanapepe Valley is a fertile area, where many foods such as banana, sugar cane, and sweet potato were grown. Besides growing taro, kalo, from which “poi” is made, Hawaiians developed salt, cultivated in saltwater ponds for trade with sailors. Salt trading was the earliest entrepreneurial legacy of Hanapepe. The right to harvest salt, handed down through families, continues today. Restaurants/shopping: You can’t go wrong at any of the small restaurants in town — we definitely found out the old-fashioned way. 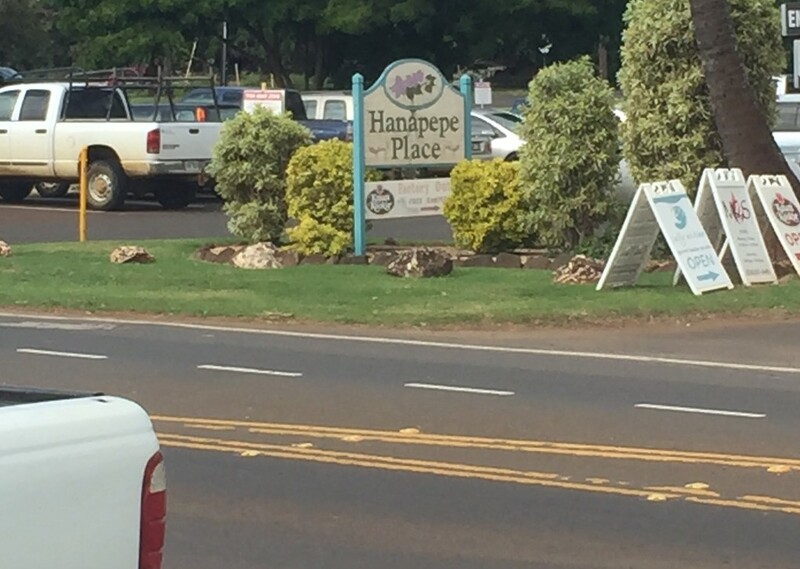 Although our first choice for lunch was the Hanapepe Cafe, they were out of pizza that day (small towns!). So, we wandered over to Wong’s Chinese Restaurant, where we enjoyed large bowls of saimin and fried dumplings. I had the distinct feeling that, no matter where we ate, the food would be delicious, fast, and friendly. 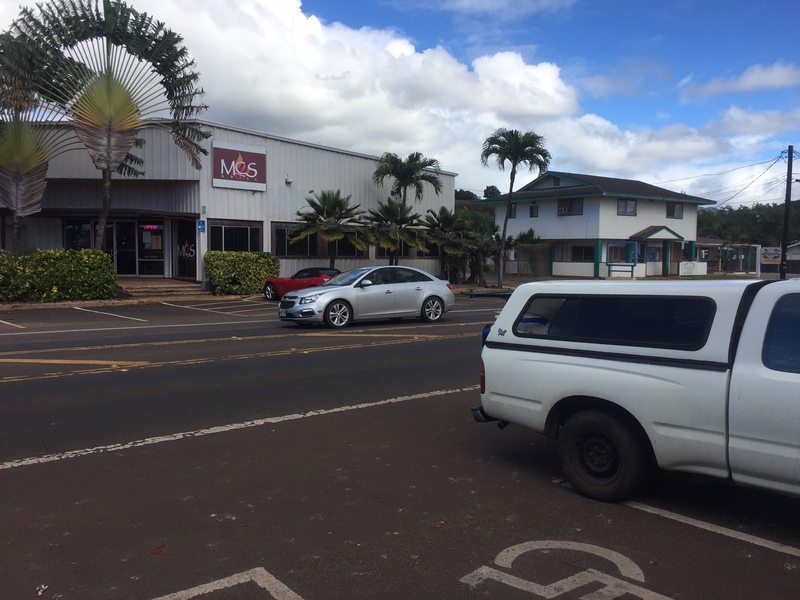 Other restaurants include Japanese Grandma’s Cafe, Bobbie’s, MC’s Grill, and Unko’s Kitchen. And, you’ll also find a whole host of bakeries, cookie companies, and ice cream shops — perfect for an after-lunch sweet! If you’re in the mood for shopping, make sure you stop by the Aloha Spice Company, the Banana Patch Studio, or Blu Umi. For such a small town, you’ll be surprised at the variety of items you can find here (and bring home to abandoned loved-ones!). Things to do: You may not think such a small town has much to offer in the way of activities, but you’d be wrong! If you’re on Kauai on a Friday night, make sure you check out the town’s Friday night festivities — every Friday Night from 6-9pm, you can stroll into more than 16 art galleries that are open to the public, meet Kauai artists, and enjoy local music and wonderful food. Most of the shops in Hanapepe are quaint and cute - and many of the signs still remind visitors of the town's past. Or check-out the town’s historic wooden Swinging Bridge, which stands guard over the Hanapepe River, the third largest river on Kauai. The bridge was originally built over the water pipe suppling water to Historic Hanapepe Town. The Hanapepe Farmers Market is one of seven county sponsored Sunshine Markets. You can meet local farmers to get your fresh fruit, vegetables, and plants many of whom are Kauai Grown members. These markets tend to last two hours, and produce goes quickly! Located in Hanapepe Park on Thursdays starting at 3pm. After a visit to Salt Pond State Park (one of my favorites), take a detour to see the town’s beautiful truck parked at the east side of Hanapepe strip. When you book a Kauai Jeep Tour through Jeep Tours Hawaii, make sure to tell your guide a side-trip to Hanapepe is on your agenda. Since the tour is a “decide as you go” tour, you can create your own itinerary. Your guide will be happy to take you to this historic town near Poipu. It’s easy to miss your chance to visit Hanapepe on Kauai, but you won’t want to! So, take that “off-ramp” and check out this big, little town on this big, little island!